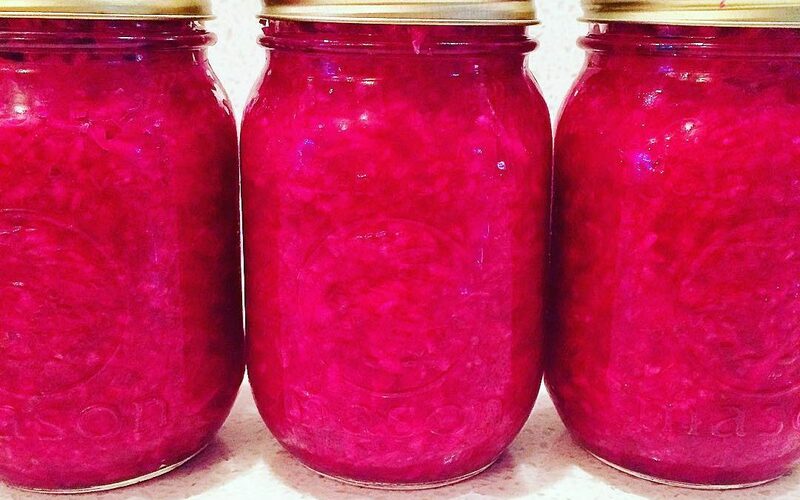 I like to make my sauerkraut with red cabbage because red cabbage contains significantly more protective phytonutrients than green cabbage. These phytonutrients act as antioxidants, anti-inflammatories and are potentially protective against a number of human diseases. Making sauerkraut is super simple. My Dad taught me how to make it, and I wanted to share his recipe with you. Enjoy! A large glass container to hold the sauerkraut in whilst it ferments (do not use plastic). Ceramic works too. Cheesecloth to cover the mouth of the container you’re using plus an elastic band to hold the cheesecloth in place. I use a food processor to shred my cabbage but if you’re really patient you could do this manually if you don’t have a food processor. I’m a big fan of food processors though, and use mine in a lot of my cooking as it’s a great time saver. Mason jars to store your sauerkraut in once it’s ready. Sea salt or pink himalayan salt (do not use highly processed white table salt). You need about 3 tablespoons of salt for every five pounds of cabbage. 1 – 2 heads of cabbage, depending on how much sauerkraut you want to make and how big your sauerkraut container is (but, be sure to weigh your cabbage to figure out how much salt you need). De-core the cabbage and shred it. In layers, place cabbage in your fermenting container sprinkling some of the salt over top as you go until all the cabbage and salt is in the container. Once all the cabbage and salt is in the container use your hands to get in there and massage the cabbage. You want to get the juices flowing and get all the salt evenly distributed. Use something to flatten the cabbage down and pack it tightly into the container. I use a potato masher and in the past I have used a large ramekin, but use whatever works for you. You want to pack it down really tightly. Place cheesecloth over the mouth of the container and the elastic band around to secure it. Every day you want to stir your sauerkraut up (use a large metal spoon or your hands) and then re-pack it down again. Do this for roughly 4 days before packaging it up into mason jars (test it to see what it tastes like before packing it up). When you package it up make sure to package it right to the top of the jar to remove as much air as possible. Store in your fridge for up to 1 year.